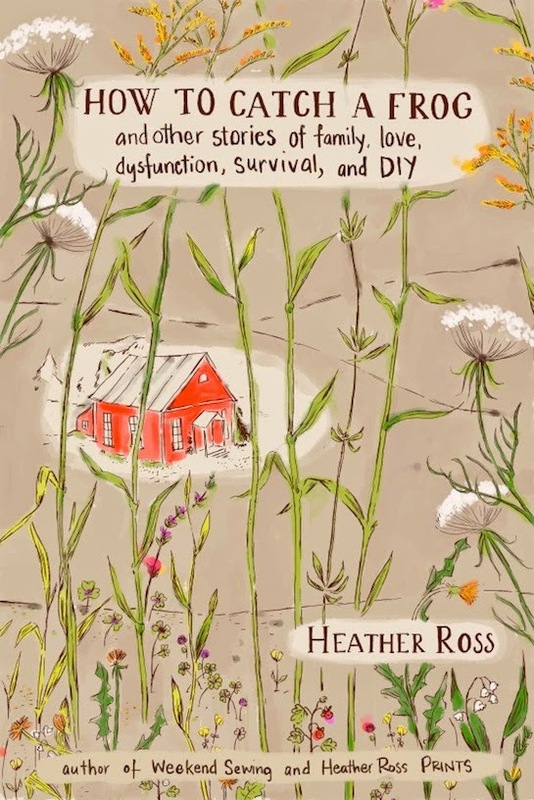 How to Catch a Frog: and other stories of family, love, dysfunction, survival, and DIY, is the new memoir by textile designer and DIY maven Heather Ross. It's a little bit DIY and a whole lot of autobiographical goodness, telling the story of her very interesting, adventurous, and often tragic life, roaming as a child in Vermont's isolated hills, living in Mexico and California, and ultimately making a new life full of love in New York City. I picked up the book casually on a Friday evening and read the first few chapters, "How to make a teepee from plastic flowers" and "How to make paper flowers." Both pulled me into a world of beautiful neglect described in a way that only an artist can see. Details matter, down to the color of the grass and the scent of the Vermont air. Each chapter details a story, centered around a craft project, resulting in a wonderful narrative flow. In this passage Ross describes her knitting projects brought back home to Vermont after a summer spent with her Grandpa and Grandma, Yia Yia. I left Woodbridge with plastic bags full of cheap synthetic yarns, needle, hooks and pins, my determination to become a good wife stronger than ever. We spent that winter in the school house surrounded by yarn and fabric, some of it from Yia Yia and her PX and some of it from my mother, who could also knit and sew and embroider. She came from a family of artists and crafts people, collectors of textiles and artwork, fashionable, worldly upper-class women who could design and make complicated and beautiful things with their hands in their leisure. We knitted up every bit of yarn that we had and then unraveled what we didn't love and knitted with it again. Ross's insights into the artist's life, especially for women born in the 1970s (which I just barely qualify for) are so honest and captivating. She tells the truth of her life without self-pity or judgment. She writes candidly about her mother, father, twin sister, and extended family and friends. She recounts visitning swimming holes and garden plots sown by her mother, learning to ride a horse, growing up as an outsider in her home town, making her own way through college, and starting her textile busines--all with grace and insight. I admit I ignored my husband and child for the next few days, as I couldn't put it down until it was finished on Sunday afternoon. (sorry family! this is why I can't read books.) Every DIY-loving person needs to read this true and inspiring book! 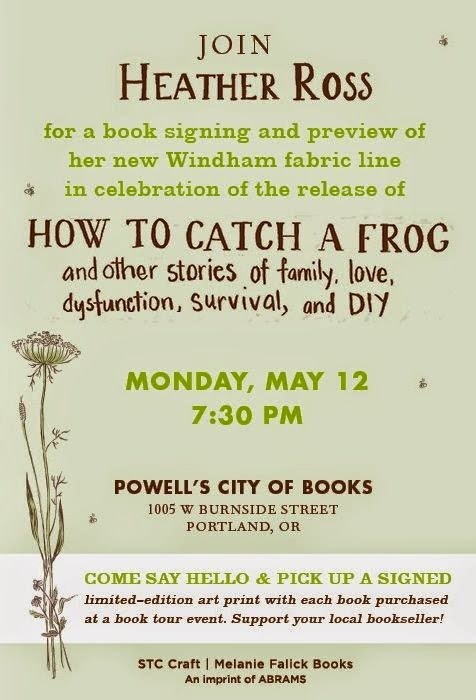 Heather Ross will be signing books and giving a sneak peak of her upcoming fabric line at Powell's Books on May 12 at 7:30 p.m. (W. Burnside location) and you are all invited. As a bonus, if you purchase a book that night you will receive a signed print from her new book!